What Are the Pros and Cons of Choosing a Male Ball Python? Male pythons will grow to be large and live for a long time. 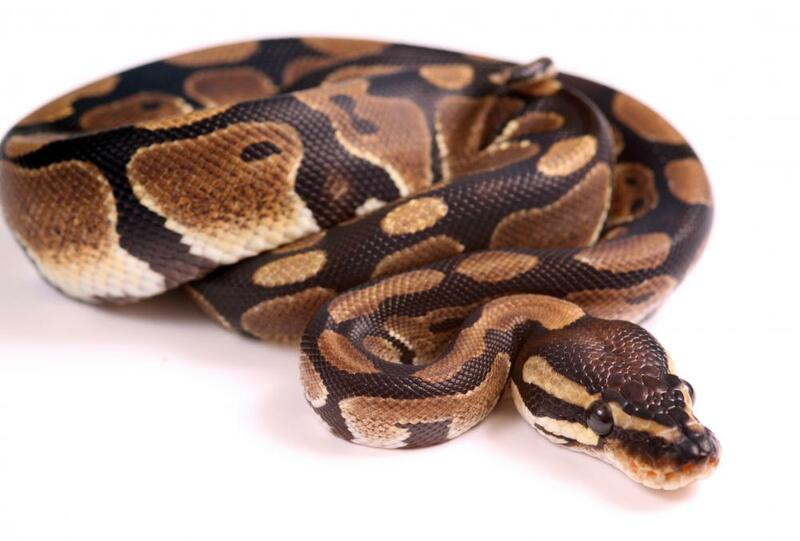 There are many pros and cons when considering a male ball python as a pet snake. This type of snake is known for its docile temperament and hardiness, making it a good choice for someone new to caring for reptiles. The male ball python does, however, grow to be quite large and will live for a long time, so snake owners must be prepared to provide care for these animals long term. One of the good things about choosing a male ball python is that these snakes are docile and relatively easy to care for. Adult males prefer to be kept in relatively small terrariums of about 30 gallons (3.8 liters). Snakes that have been raised in captivity are often accustomed to eating frozen mice and rats, which makes them easier to feed than snakes that require live prey. Male ball pythons are usually relatively easy to handle, preferring to curl into a ball when frightened or threatened rather than snapping at their handlers. Though a male ball python does not require a large terrarium to live in, its tank will need to be kept warm and humid. In the wild, these snakes are found in tropical climates, which makes heating and humidifying their enclosures important in order for them to stay healthy. The cost of heating fixtures and humidifiers and the electricity needed to run them can make caring for male ball pythons more expensive than caring for other types of snakes. Some people may have second thoughts about choosing a male ball python because these snakes do get rather large. Ball pythons can grow to be up to 6 feet (1.8 meters) long, though they remain rather light, at only about 5 pounds (2.2 kilograms). Males of the species do not get as large as females, however, either in length or weight, so new snake owners may prefer starting with a male rather than a female ball python because of its smaller size. Though not particularly heavy, the male ball python is still a strong snake and can push its way out of many enclosures. A male ball python will live for an average of 20-30 years and this long lifespan could be considered a positive or negative attribute of owning one. On the one hand, these snakes are hardy and require little in the way of veterinary care in order to live a long time. On the other hand, getting a male ball python is a long-term commitment and people need to consider carefully whether they will want to keep one as a pet for such a long period of time. How Do I Build a Ball Python Enclosure? What Are the Best Tips for Ball Python Breeding? What Is a Spider Ball Python?